AT3-300A Automated Programming System | FALCON DENSHI K.K. 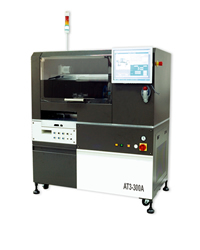 AT3-300A is a professional pick & place auto programmer for ICs on / in tray, tube and tape. System provides intelligent operation for IC programming/testing, marking/labeling and packing conversion with powerful software control. The resident Programming Module offers efficient and reliable multi-site IC programming. Optional mark-on-tray / mark-on-tape or label-on-tray is available after programming. A variety of I/O devices can be mounted and changed easily providing flexibility of input / output options basing on IC packing form. ■Excellent performance --- The system can operate a variety of input and output options with tray, tube and tape I/O devices thus provides programming/testing, marking/labeling and packing conversion for most of IC products on / in tray, tube and tape. ■Intelligent operation --- Automatic pick & place operation in sequence of IC loading / pickup / positioning / insertion / programming / sorting / optional marking or labeling / unloading with powerful software control. ■Reliable programming --- The built-in programmers, ALL-100 series, are designed with high speed CPU, resided FPGA, high capacity pin drivers and USB interface, thus providing a high speed, low noise, stable and reliable programming platform. ■Optional marking / labeling --- System provides optional dot / alphanumeric mark-on-tray / mark-on-tape or label-on-tray after programming. ■Easy change-over & maintenance --- Easy and fast change-over of socket modules and I/O devices when switching IC products among tray, tube and tape. Power-on self diagnostics, I/O Mode utility and module design allow system easy for maintenance, repair and replacement.